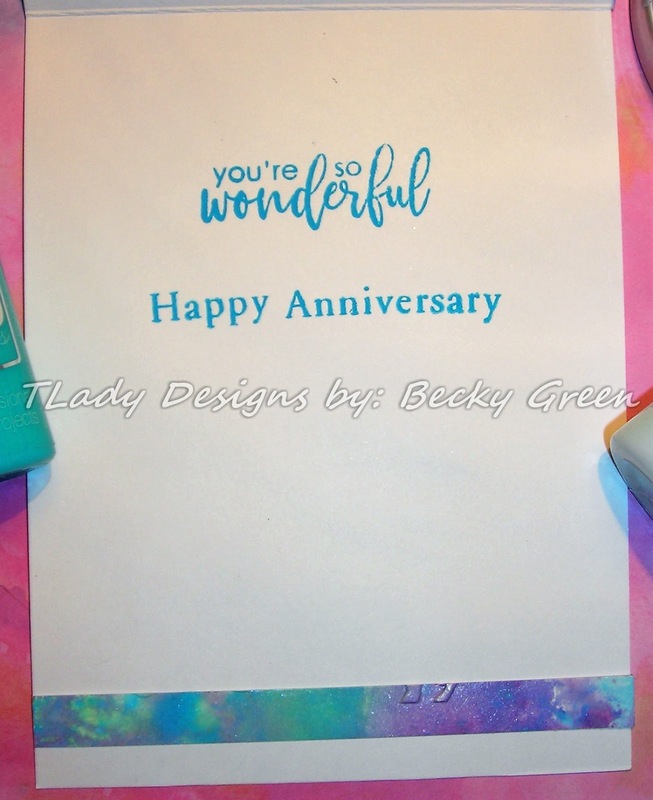 Here today with a special card for you. So of course, I made a card for the celebration. I used some of the extra I had left over from my last card posted! 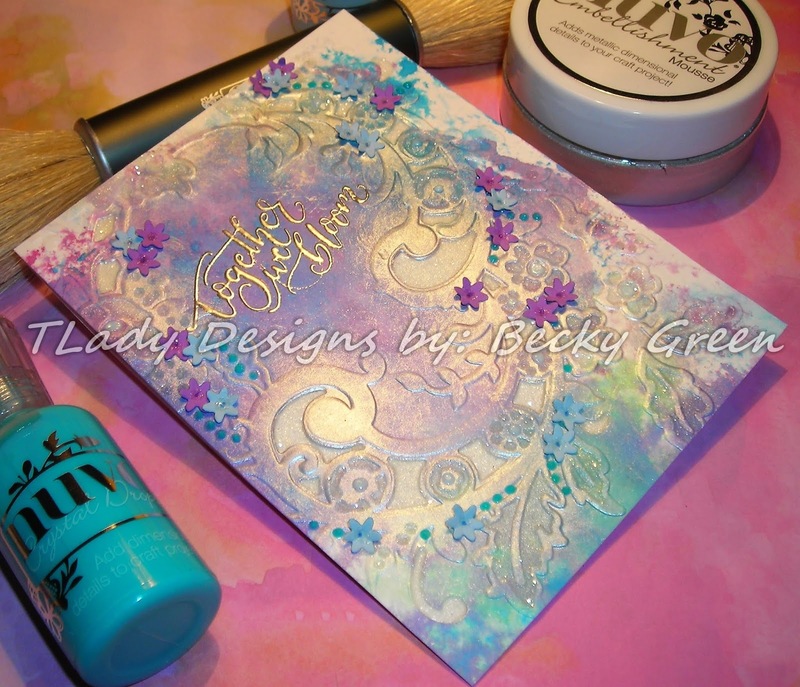 SB- Baroque Filigree Embossing Folder. 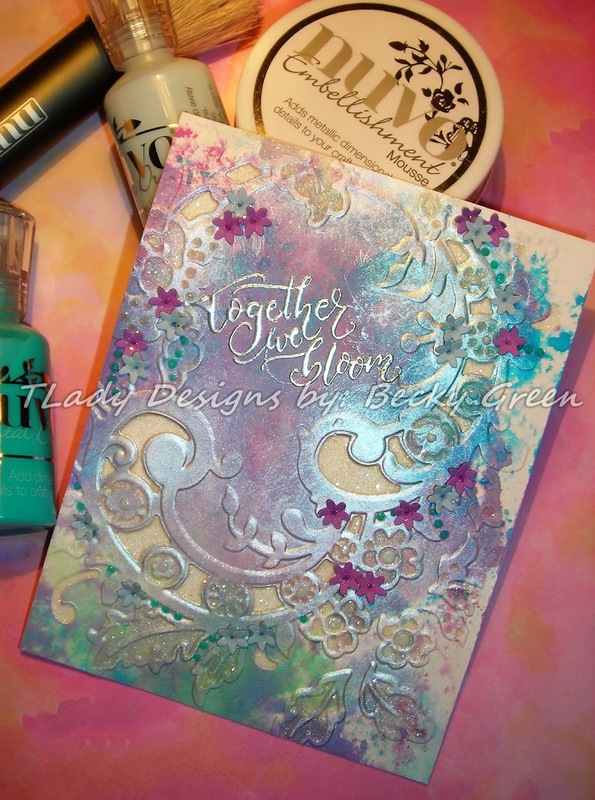 Opening my Multi-Purpose Platform all the way open, sandwich 1 clear cutting plate, your embossing folder with card stock, & a Go! plate on top of that. I then, used Nuvo Embellishment Mousse-Silver with a Nuvo Dual Tipped Blender Brush. 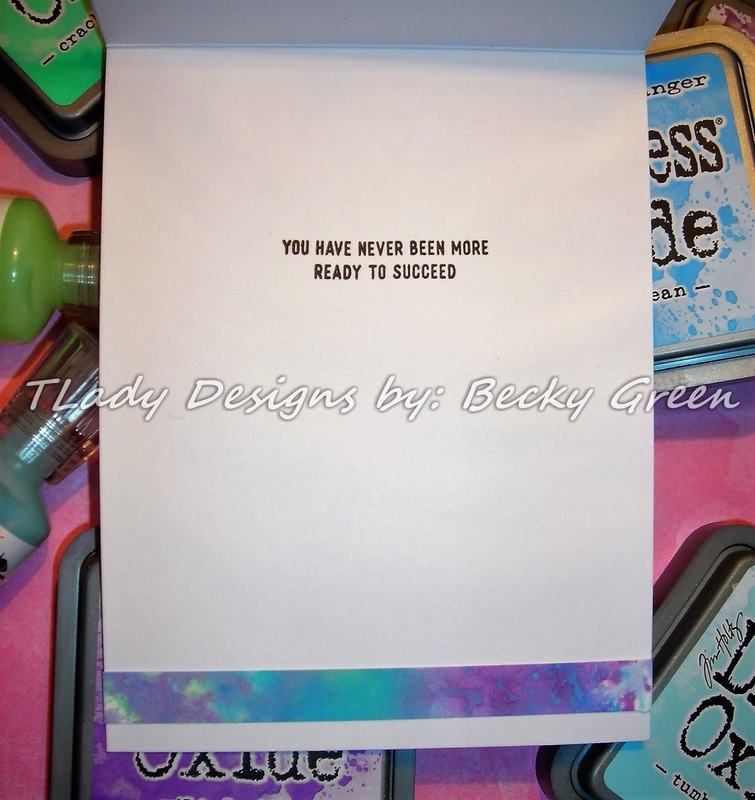 (I could have used my Clarity Brushes, but I wanted to keep those just for color without the shimmer.) 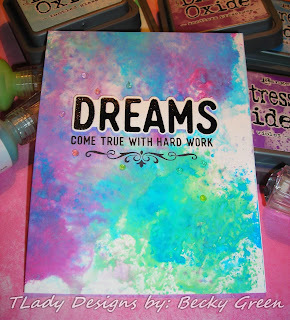 I just followed the embossing, swirling my brush around over the embossing. I put a white piece of card stock behind the front piece & ran my silver mousse over it where the openings are for a light shimmer. But, I decided to add Glossy Accents to the openings & then I poured MS- Crystal Fine Glitter over top of that for more sparkle. Stamping it in Versa Mark & sprinkling SU- Silver Embossing Powder. 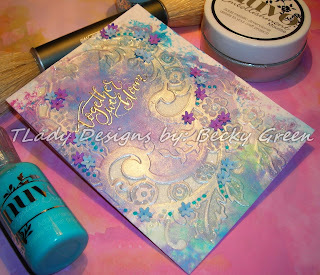 I also added Nuvo Crystal drops along some of the embossing. I used a strip from the front I had trimmed off. Here you can see the shimmer & shine wonderfully! 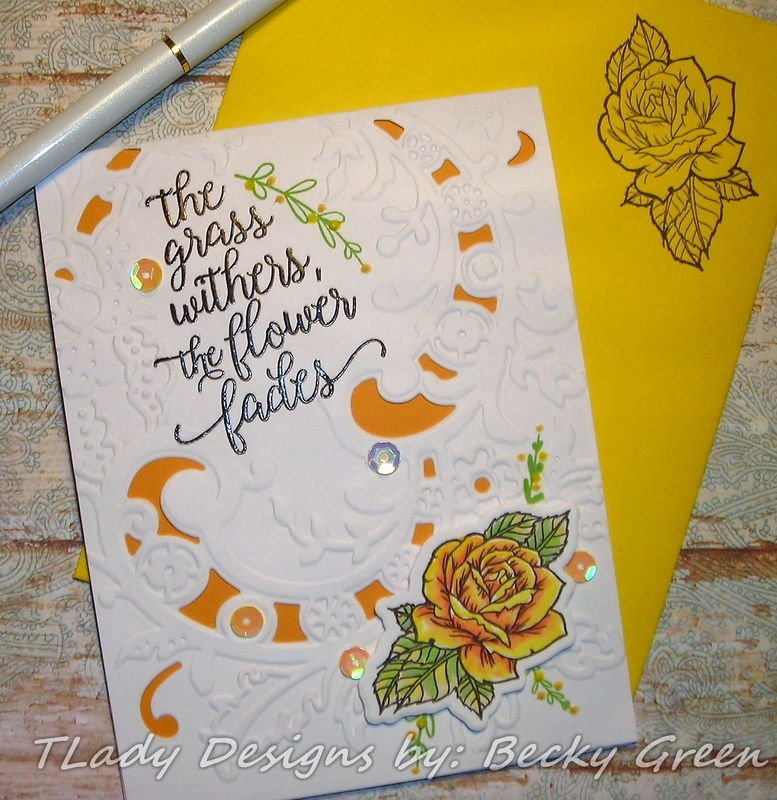 It still didn't look finished to me, so I added I.O.- Tiny Flowers- DIE140-D.
Shaping them with a Shaping Mat & McGill Stylus. & the sparkle of the glitter of course! I'm here today with a simple encouragement card. 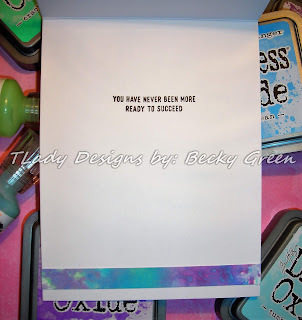 Encouragement cards are the kind of card I make the most here. Whether it's for family or friends. Is it that way with you? My inspiration was our daughters new bed cover for grad school that she found on sale. 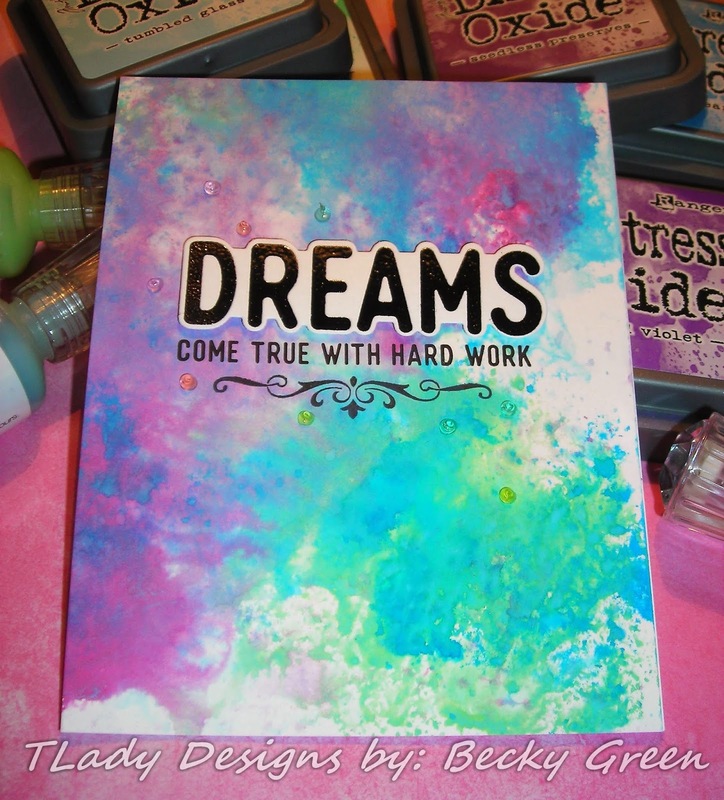 Mostly white with water color splashed across it in the same colors below. & cut it down for my card front. 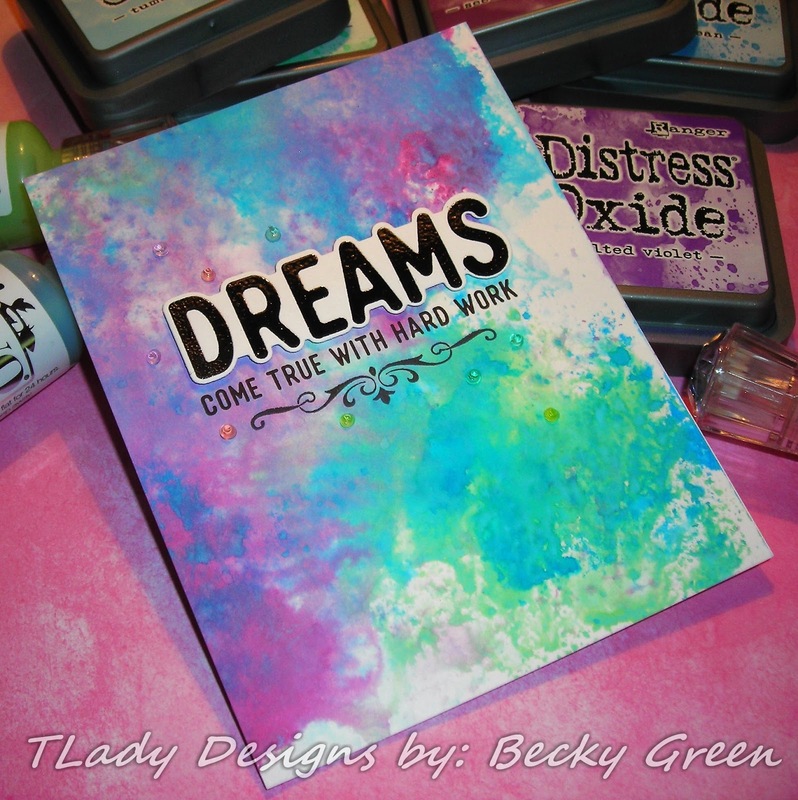 I used Oxide Inks, a PIM- Protect It Craft Mat, & a Distress Sprayer. The sentiment I used is from SSS-Yes You Can- cz20. It's one of SSS newer releases. I wanted it the minute I saw it for the wonderful sentiments of encouragement! 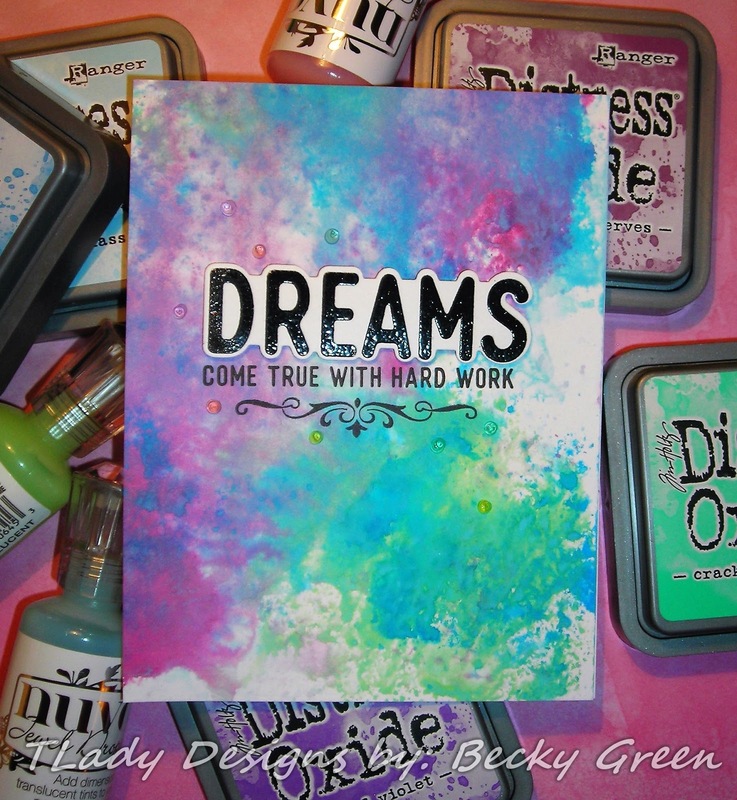 I also LOVE how the word Dream is die cut! 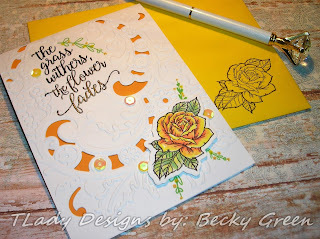 Another plus for me, was that the sentiments could be die cut, for beautiful card fronts. There are actually a few sentiments that could be used with the main sentiment, dream. I used a strip of the Bristol Smooth on the inside too. along with some Nuvo Jewel Drops. 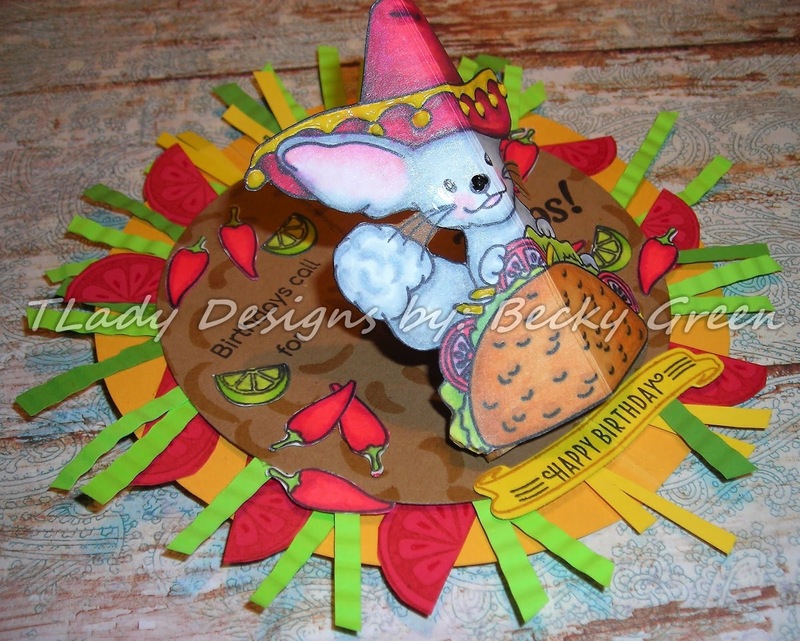 Not much needed to be added to this free & fun colorful card. Hope you like & are inspired to encourage someone today in their dreams! ALWAYS check the Clearance Isle! I was able to find other things in the Clearance Isle too, that I'm not ready to show you today---example: $25 item for $6. Anyway here is what I made! 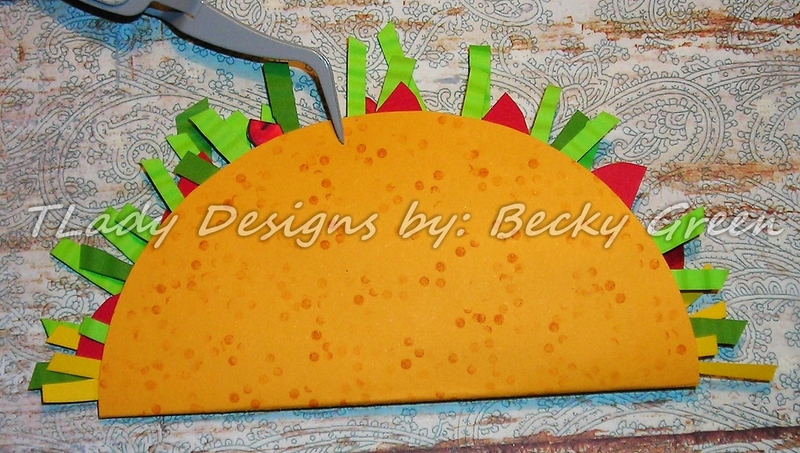 I started with a piece of card stock cut & scored for my card base--4 1/4" x 5 1/2". 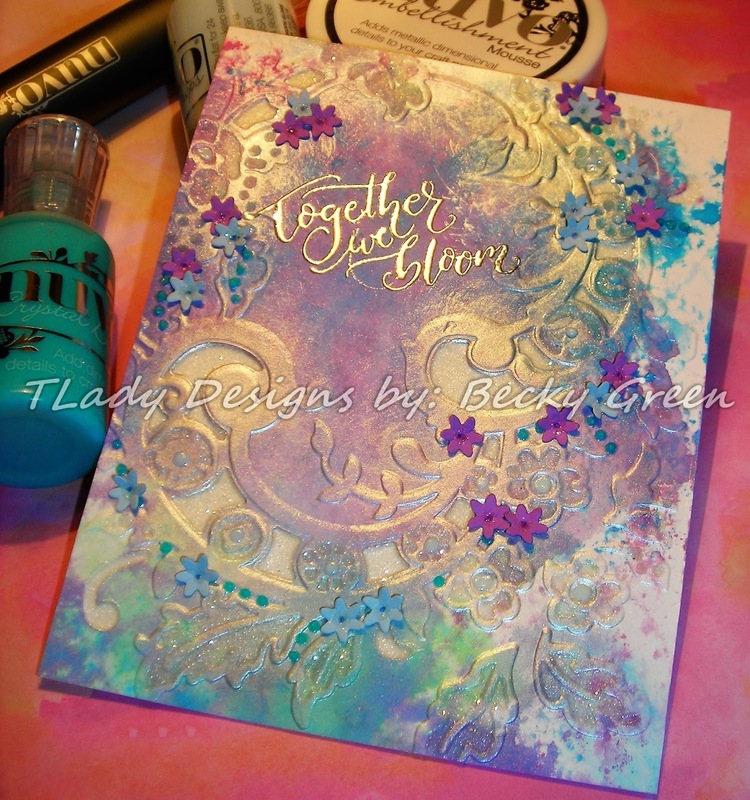 I ran it through my Big Shot with Spellbinders- Cut & Emboss in One Pass-Baroque Filigree! 1 clear cutting plate, Embossing Folder with card stock, & a Go! Plate on top! Perfect for a quick card! 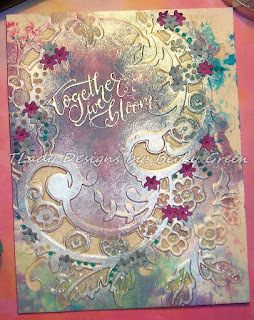 I also found Spellbinders- Moon Flower- SDS-098 reduced, on another trip to Hobby Lobby! 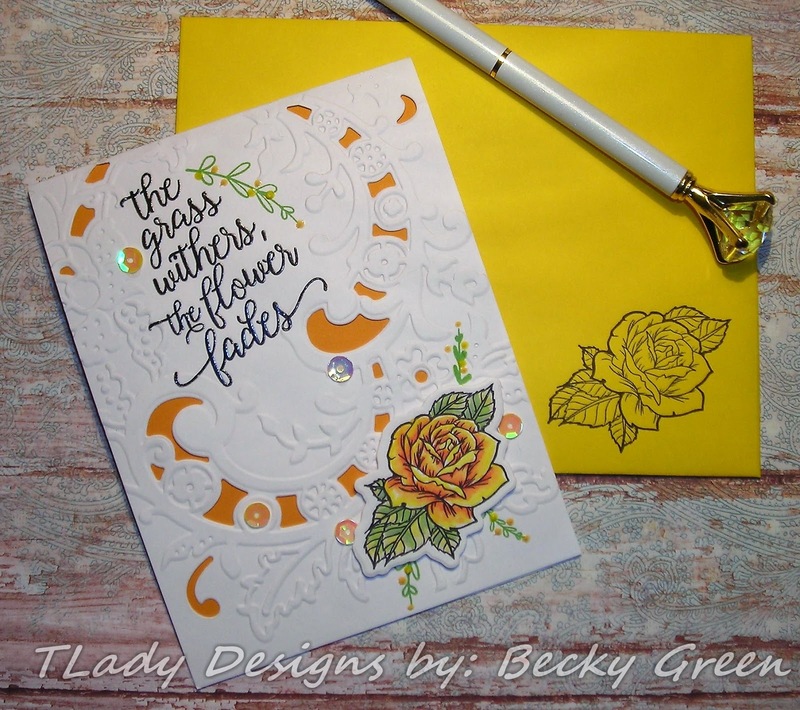 The flower is stamped on Bristol Smooth with SSS-Premium Black Dye Ink & water colored with Oxide Inks & a Nuvo Aquarelle Brush. I used about 3 different colors of ink on the flower, & 3 different colors on the leaves. I find when you use 3 different colors you end up with a nicer blend & more depth. The sentiment, inside & out, is from PTI- Garden of Faith. Notice my little sprigs of green? I just added some colored card stock to the back of the front panel, some heat embossing on the front sentiment, Nuvo Crystal Drops & 28 Lilac Lane Sequins & I was done! Don't forget about the Promises of God as you go about your day today! but I have one I made today, as I was informed that someone close to me likes cutesy-tootsie! This person also likes Taco's! 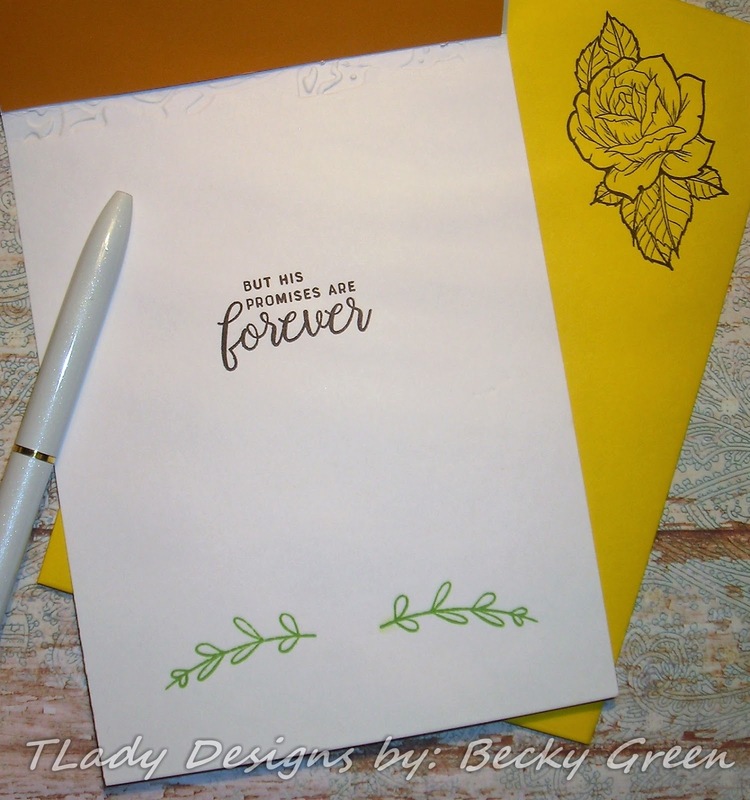 I KNEW this stamp set would come in handy! So, with this little stamp set, I got an idea on how to make my card totally fun!!! 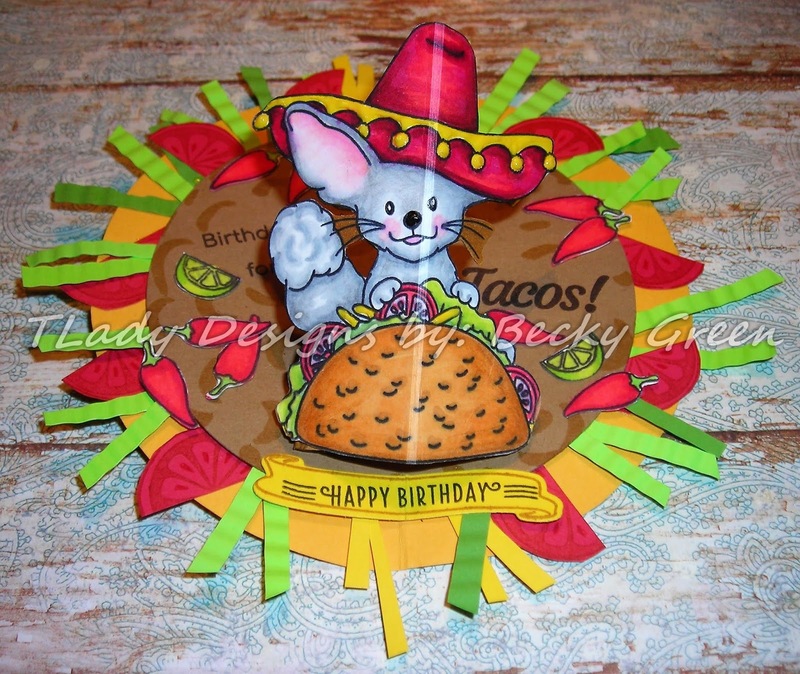 I created a pop-up card! 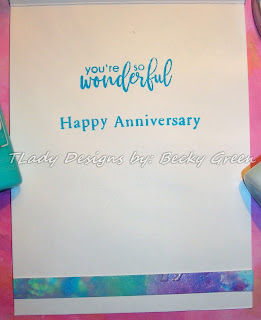 Simon Says Stamp World Card Making Day Celebration. 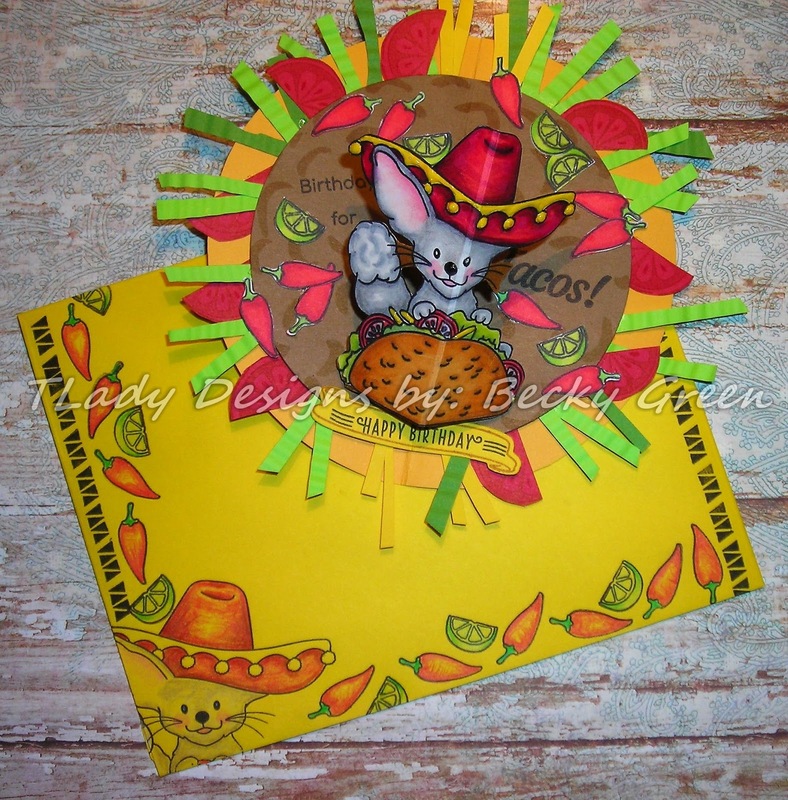 I think my card has a flair for World Card Making Day with it having a national flair! This is the outside of my card. Notice: The lettuce, cheese & tomatoes sticking out? 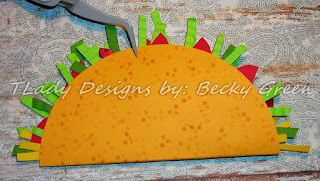 I used a protractor to create my circle for the Taco Shell with a Pilot-G-2 07 Mechanical Pencil. My circle came out to be 4 5/8" & scored at 2 5/16" for my center score. I only stamped the outer side of my Taco. 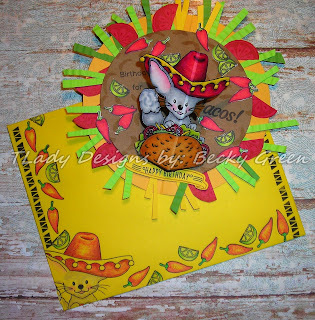 I did a smaller circle with a SB- Classic Circle Die in brown for the burger. 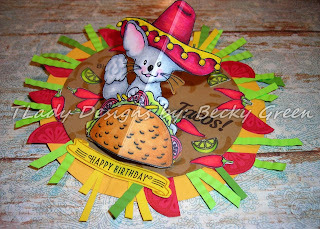 saying "Birthdays are for Taco's!" 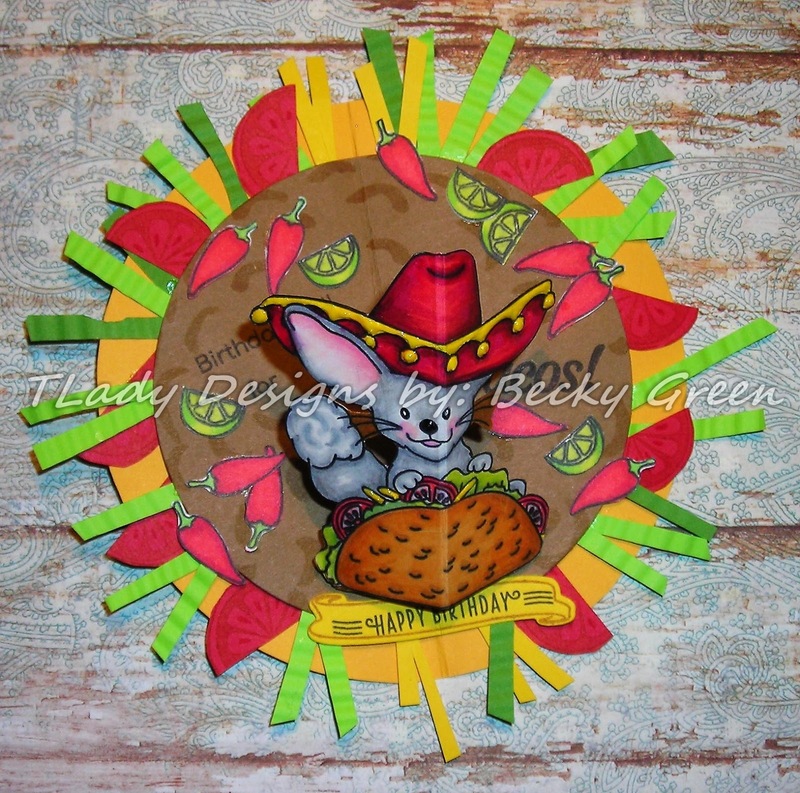 done in two colors of green, & even a bit of yellow for cheese! stamping only one side & snipping them in half. Now for that SWEET little cutie popping up! He is the main image from the SSS-Taco Party Set. I colored him with Spectrum Noir, & Copic Markers with a touch of Faber Castell Pencils. And just a little Nuvo Crystal Drops on his hat & nose. The front sentiment "Happy Birthday" is by PTI- Cloche' Quarters & Cloche' Spring Fillers. The little limes & peppers are also from the SSS- Taco Party Set. 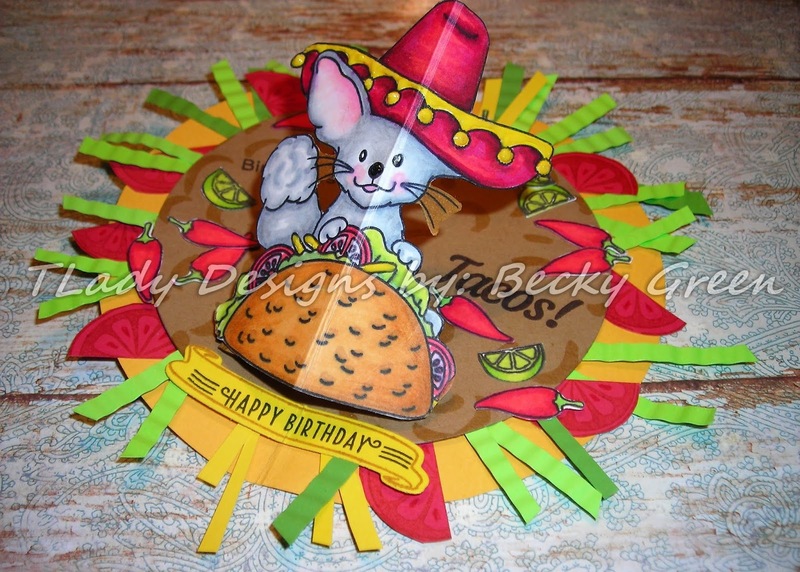 and are busily making your own card/s today for this event! See you over at SSS!